Love a Sunday lunch? There’s nothing better than a traditional Sunday roast in a country pub. Especially if the food is sourced locally, and cooked carefully from the highest quality ingredients. And when that country pub is in the beautiful Vale of Belvoir, with a beer selection that merits a mention in the Good Beer Guide, then it’s pretty much perfect. Join us between midday and 3pm every Sunday for our traditional Sunday lunch at the Geese and Fountain. We offer a choice of traditional roast meats (always featuring roast chicken breast from birds supplied by Gerald Botterill of Croxton Kerrial, and often also featuring hogget, pork, Dexter beef, all farmed locally, and Belton Park venison, supplied exclusively by George Skinner and Sons of Barrowby. In addition we always offer two vegetarian main courses, one entirely home-made and one featuring Cauldron’s vegetarian Lincolnshire sausages which have won gold in the Great Taste awards. In the summer we also offer a salad main course option if you’re not feeling like the full roast dinner experience. Sunday lunch is charged at £14.95 for two courses, and £18.95 for three. Starters and desserts change every week, but we always feature a couple of vegetarian starters. 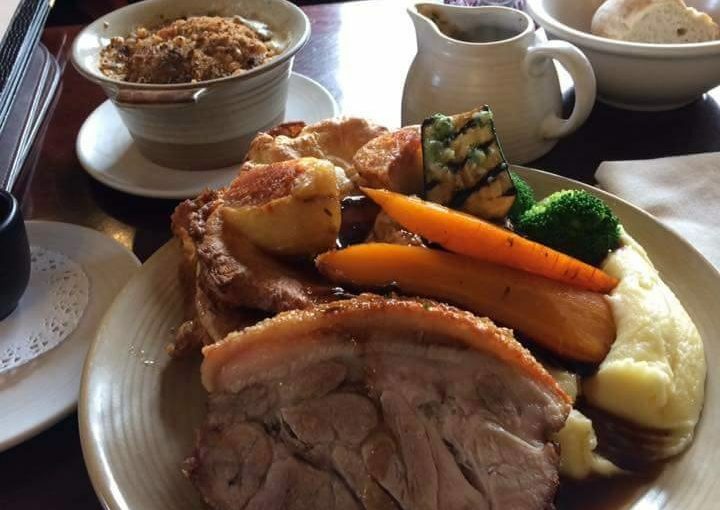 If you have any specific dietary requirements, please advise us at the time of booking your table, and we will endeavour to ensure you can enjoy your perfect Sunday lunch. All served with roast and mashed potato, Yorkshire pudding, roasted carrot and onion, cauliflower cheese, seasonal vegetables and gravy.